Sited in the most enviable position in Dublin, overlooking James Gandon’s Four Courts masterpiece on Inns Quay, is an unassuming city mansion – Number 9 Merchant’s Quay. This house was one of the Trust’s most transformative conservation projects that rescued the derelict 18th-century building from almost certain ruination, turning it around to become one of the most beguiling houses in the city. In the broad sweep of Dublin buildings, Number 9 is instantly seductive. Rising four storeys over basement, with a deeply chiselled, rusticated granite ground floor, it features a rare blind arcade of repeating windows and doorcase. Above street level is a façade of russet-toned brick punctured with sinuous, dark-painted windows and delicately ‘feathered’ window reveals. 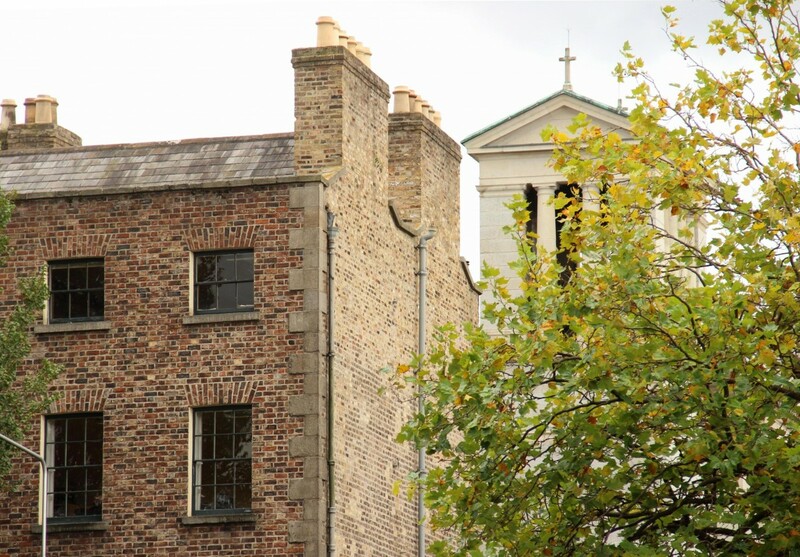 Scenically positioned behind is the Church of the Immaculate Conception – better known as the Franciscan Adam and Eve’s – whose classical façade, belfry and copper dome inject a courtly air of Italian urbanism to the banks of the Liffey. The stoical façade of Number 9, which straddles four bays along the quay-front, cloaks a deeper rarity – namely, two entirely separate houses that were conjoined during the 18th century. Rarer still is the antiquity of one of the houses, which likely dates to the late 17th or early 18th centuries, and a surviving boat jetty that provides subterranean access to the Liffey. The Trust undertook a meticulous refurbishment of the mansion between 1998-1999 in conjunction with Dublin City Council, where it continues to be used as offices by the local authority.